Galvanic™ - The one for all forever. It attracts everyone with it's open attitude; It differs from the traditional black color which brings quiet mystery with it's flamboyant color; It challenges the market and competitors with it's precision cutting, proper fitting, competitive price, simple installation and perfect services. Welcome to Galvanic, he is been waiting for you. Wanna have a visual feast? The Galvanic world has been never clearer and better than ever before, just with the premium raw materials and color enhancement technologies, it makes everything more real and clear when looking through. Afraid of going out and stretching your limbs at the glare? Choose Galvanic™, fishing, driving, skiing and traveling are not problem at glare. Galvanic™ truly-polarized technology reduce glare, enhance contrast, and provide full UV protection, making lenses become the effective shield against dazzling glare caused by scattering, inflection, and reflection of the light. Worried about the lenses will be scratched easily? The hard-coated in the lenses' surface could prolong the life cycle period, and all Galvanic lenses meet most of the industry standards, scratched easily is the past issue. Galvanic™ nano hydrophobic coatings will repel against the water, oil, sweat and dust. Fear for the product's warranty? We are 24-hour online, any doubt, please don't forget to contact with us. 365-day manufacturing warranty and 60-day money-back guarantee - Your 100% satisfaction is our unremitting pursuit. 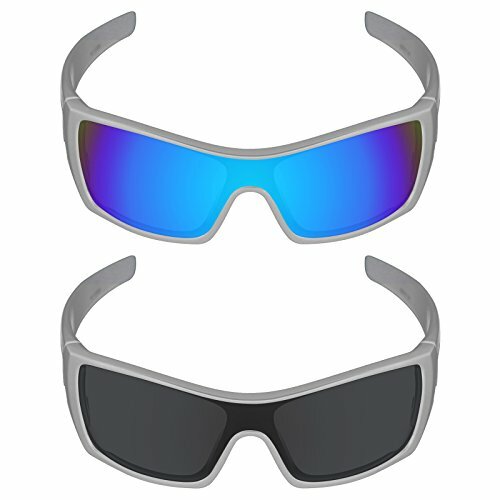 Galvanic Optics is not affiliated with Oakley in any capacity, any usage of Oakley is only to describe those products. If you have any questions about this product by Galvanic, contact us by completing and submitting the form below. If you are looking for a specif part number, please include it with your message.